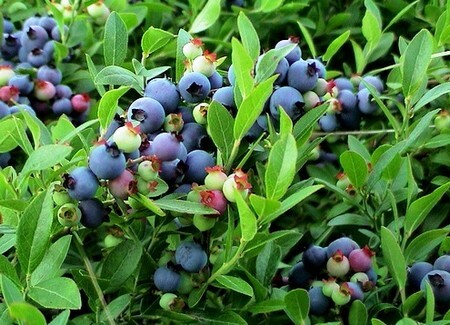 The high-bush blueberry is becoming more popular in the garden. The rich, fruity flavor that is a characteristic of the berries has made it popular as a fruit to be eaten straight from the bush and for inclusion in an ever-increasing number of desserts and other dishes. Its disadvantage as a garden fruit, at least for some people, is that it must have acid conditions. In chalky or limestone (alkaline) regions bushes could be grown in large containers away from the normal garden soil, but this could become quite a chore, no matter how tasty the resulting berries. Choose a sunny site, although a little light, partial shade will be tolerated. The soil must be acidic. Add ericaceous compost (soil mix) if your garden soil is just on the borderline. Set out the plants at any time the weather and soil conditions allow between autumn and early spring. Plant them as free-standing bushes, 1.5m apart. Mulch with manure, but only if it has not been “sweetened with chalk or limestone. An ericaceous compost can be used or marginally acid soil. Do not allow the soil to become dry, watering regularly as necessary. Propagate from soft­wood cuttings taken in midsummer. Because the fruit appears on the second-or third-year wood, do not prune until cropping starts. After that, cut out any dead or weak wood and then remove up to a third of the oldest wood to promote new growth. Prune in winter or early spring.